In this month’s episode, Tim and Scott preview the bracket, which will be announced tomorrow at 9 a.m. Eastern time. 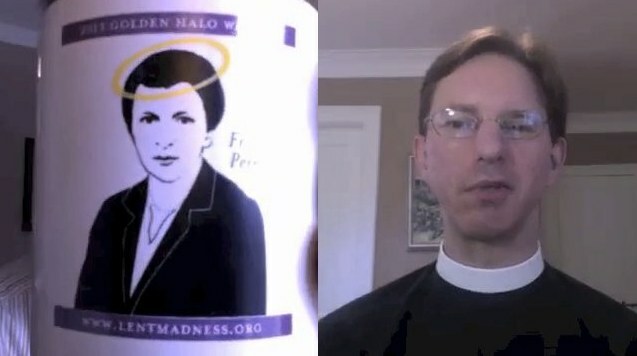 Also, Scott demonstrates his new Lent Madness mug featuring Frances Perkins. Oh, and three celebrity bloggers make cameo appearances in an outtakes reel never to be forgotten. Order your very own mug featuring Golden Halo 2013 winner Frances Perkins from the Forward Movement website. Buy one for yourself and some more for all your friends & neighbors. If your collection is incomplete, don’t forget to buy the mug featuring Mary Magdalene, winner of the Golden Halo 2012. Watch more Lent Madness videos on the Lent Madness channel. It’s a better evening than House of Cards, unless you think Congress is better than Jesus. This image is here for social media sharing. Never mind. 2 Comments to "Monthly Madness — July 2013"
Finally….at last I can plan for the entrance to my humble abode of the 2013 Golden Halo winner! My order will be in the mail ASAP. Mary Mags will be retiring as soon as Frances arrives. The Gallaudet family were pioneers in the development and spreading of Sign Language, the establishment of primary-education schools for the deaf, the founding of Gallaudet University as well as the establishment Episcopal parishes for the deaf. With a Gallaudet in the bracket, there will be plenty of interest in Lent Madness within the Deaf Community. It would be inclusive if a text overlay could happen to any video postings. « 2014 Celebrity Bloggers Announced!